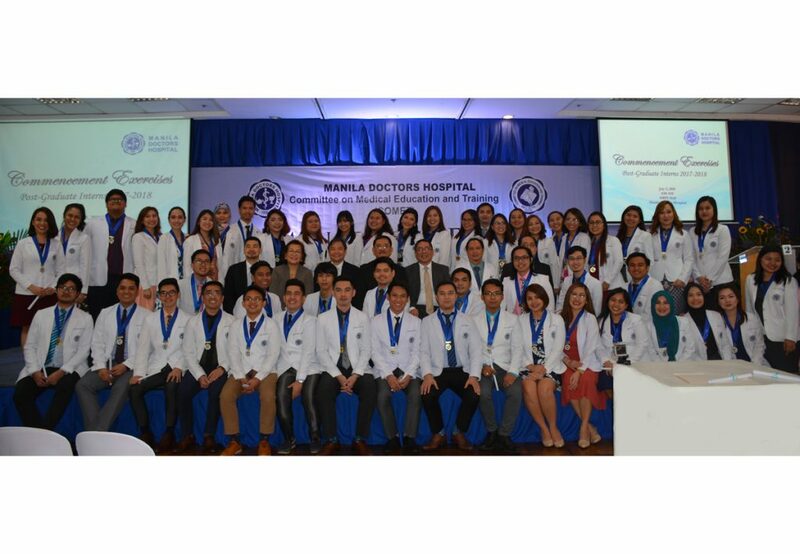 Manila Doctors Hospital recognized this year’s batch of 54 postgraduate interns during the graduation ceremonies held last July 5, 2018 at the Metrobank Foundation Hall. The completion of the interns’ one-year medical training with MDH’s roster of competent and highly-skilled doctors was part of their requirement for licensure examination. Hospital Director Hian Ho N. Kua, MD led the Awarding of Certificates of Graduation together with Medical Director Mario Joselito M. Juco, MD, Deputy Administrative Director for Special Directors Terrence L. Cham, MD, Medical Quality Management Coordinating Team Chair Cynthia Cuayo-Juico, MD, and Committee on Medical Education and Training Chair, Romeo U. Meriño, MD.